Today was the day that I finally made my manure bin, it only took me a year! 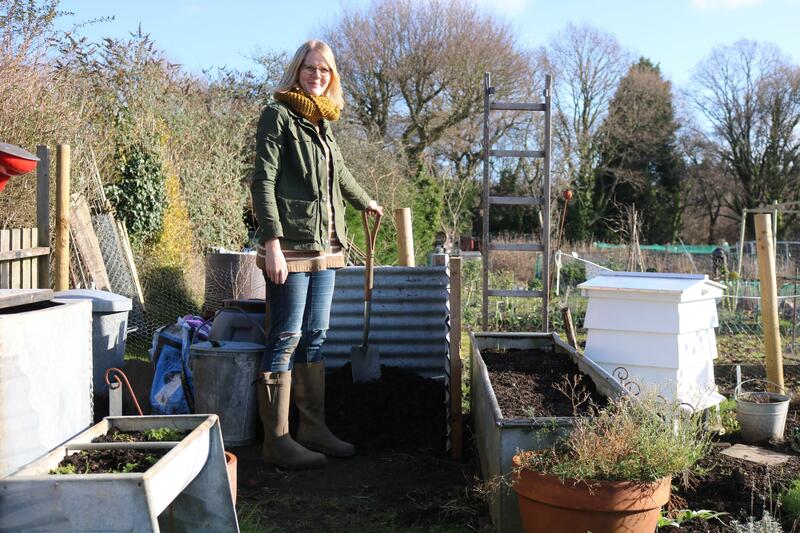 We’ve all got one of those jobs that we keep putting off, the job that’s not that important so keeps getting pushed right to the end of the list… The manure bin was that job for me but I was determined to get it completed before the busy growing year officially started. The job actually started last weekend and would have been finished then too if I had the right tools with me… unfortunately I didn’t so instead I started the ball rolling by creating the main frame. The 6 wooden stakes had been cut down to size a few months ago now, I had cut a point to each piece and also painted them with wood preserver to make them last that little bit longer once they were in the ground. 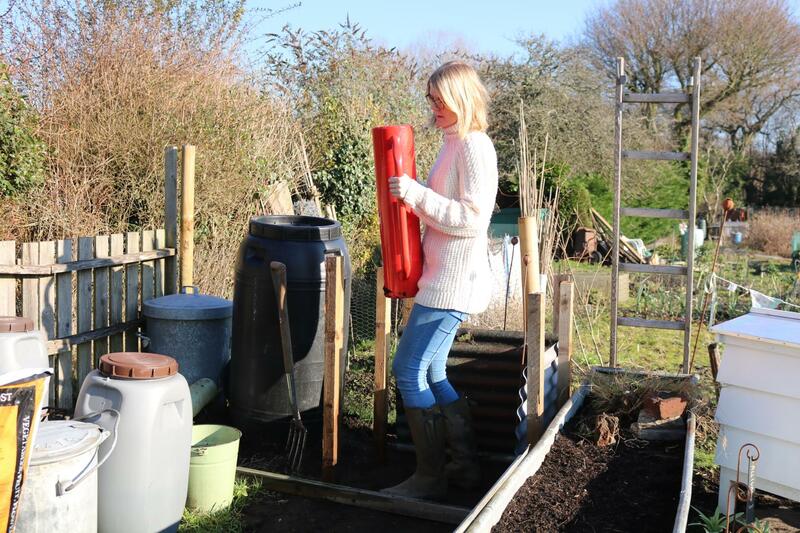 I carefully measured the layout and used my trusty post knocker to knock each post into the ground. Luckily I had some galvanised sheeting left over from my roof and there were 3 pieces already cut to 83cm. Therefore all we had to do was cut another 250cm sheet of galvanised sheeting into 3 equal sized 83cm pieces… if that makes sense. My Dad helped with this part and used an angle grinder with a cutting disc made to cut metal, they were cut in a matter of minutes! 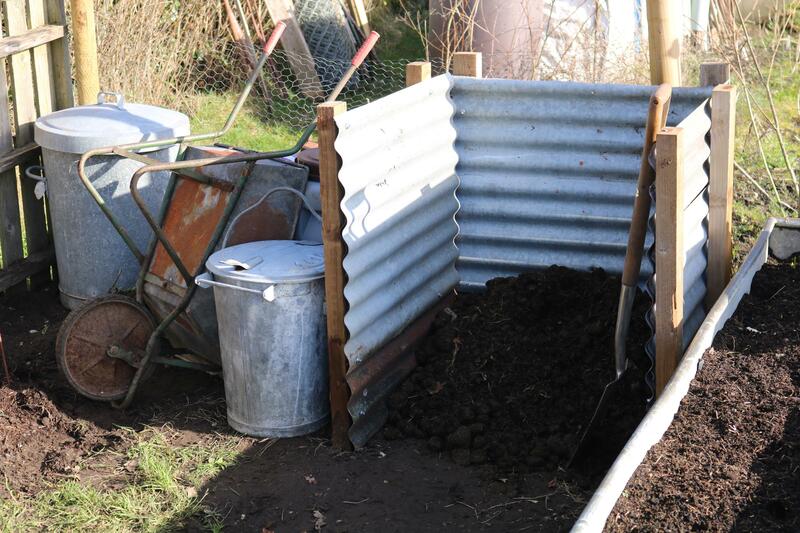 So altogether I had 6 pieces of 83cm wide sheets of galvanised to make my manure bin with. Left over from the roof were also some self drilling screws with washers on them, a bit fancy for this job but seeing as I had loads left over I thought I might as well use them (although large headed nails would suffice!) 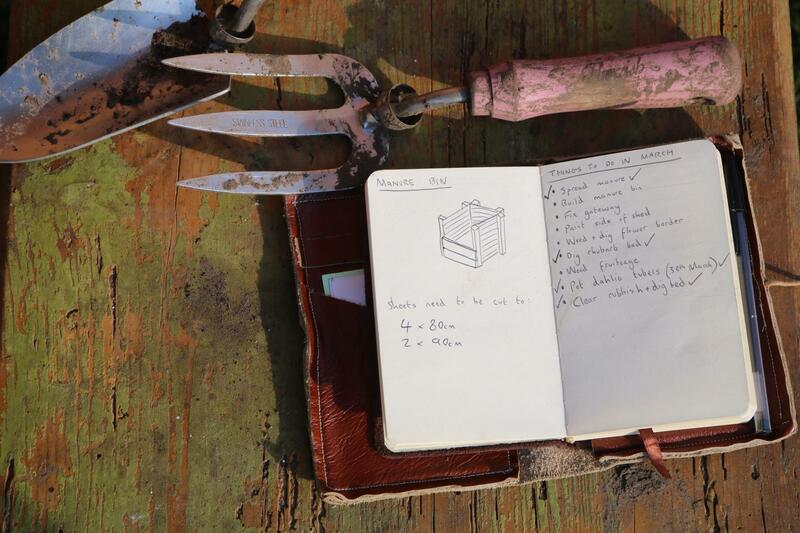 This is when my boyfriend, Charles, let me into a little secret and a much cheaper way of completing my manure bin. 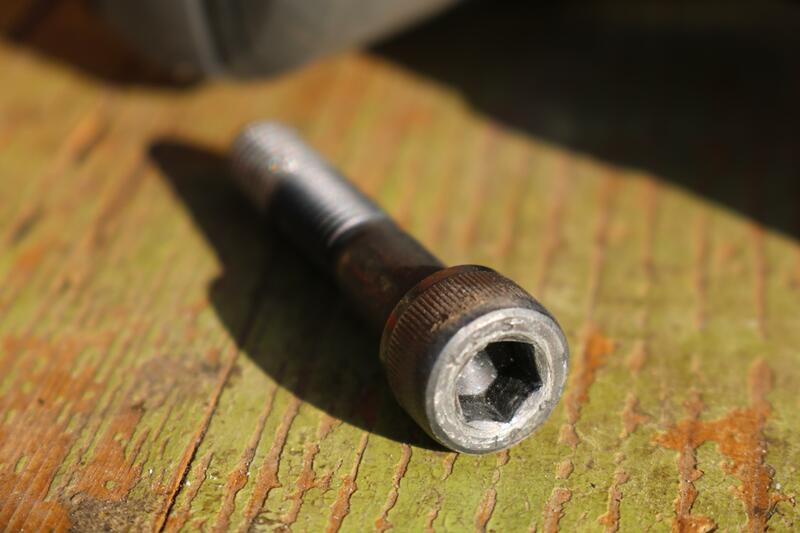 He sent me a socket cap allen bolt in the post to use as a drill bit in the cordless drill. 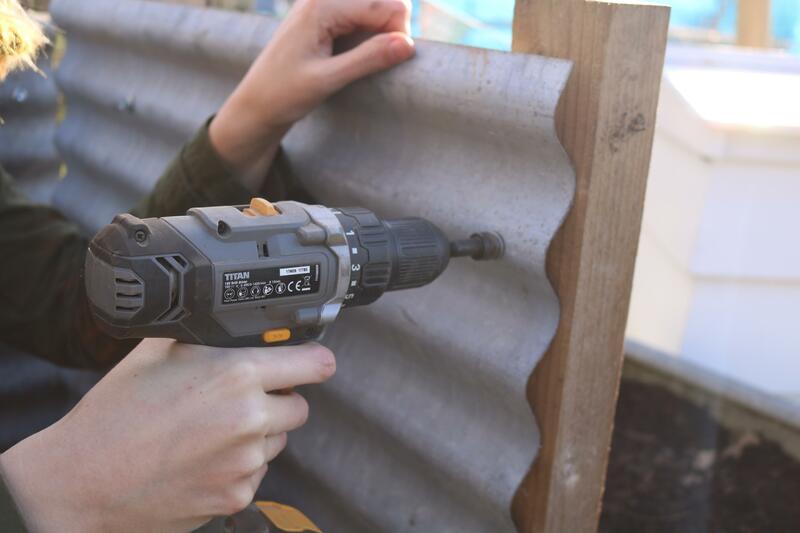 After hammering a screw into the galvanised sheeting to make a dent I used the cordless drill with the allen bolt attached to secure the galvanised sheeting to the wooden uprights. It worked a treat and made light work of completing the bin! To reach the required height I overlapped two pieces of sheeting so that I could pile even more manure into the bin and made a start on the pile by adding some manure I had collected during the week. Overall it measures roughly 83cm squared but you can obviously make your own bin to suit your own needs. 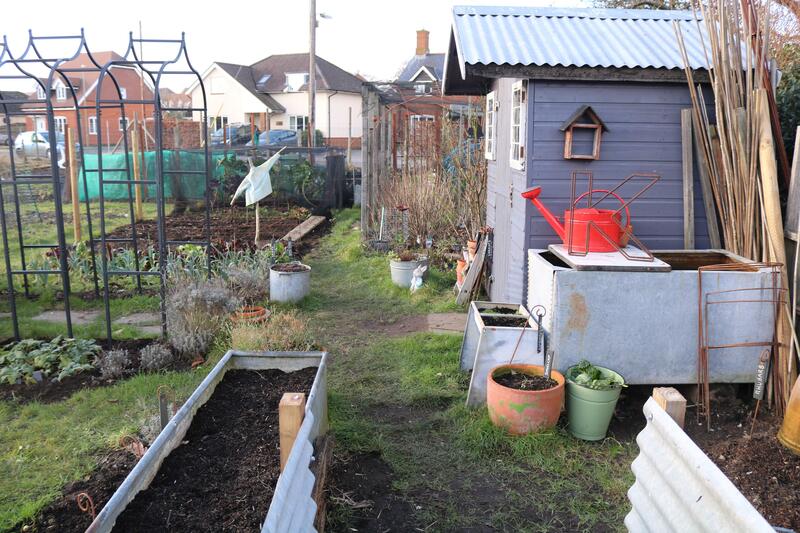 Seeing as my plot is rather small I could only really have a small manure bin but I am so pleased with it. It’s my mission this year to look after my soil more so I’m sure this manure bin will be well used. 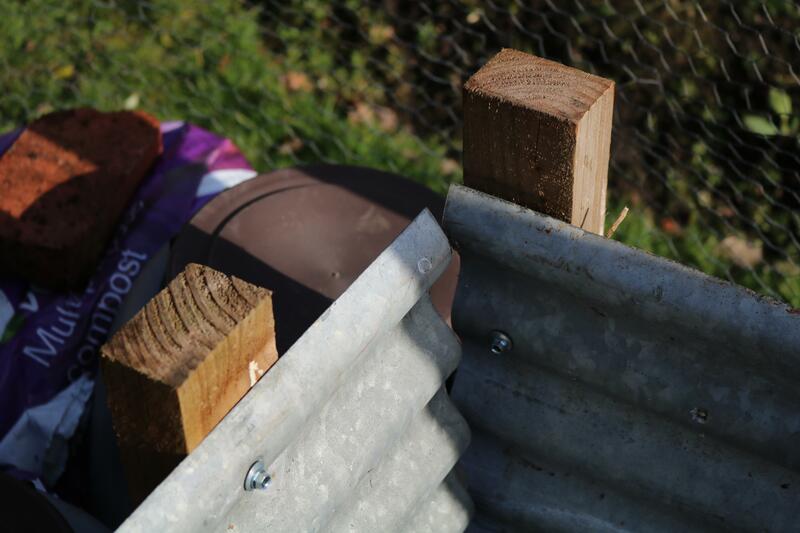 Plus I made sure to position the wooden posts at the back so that I can balance a piece of scaffold board along the top, this will create a little shelf above my bin where all my homemade fertilisers will be stored. 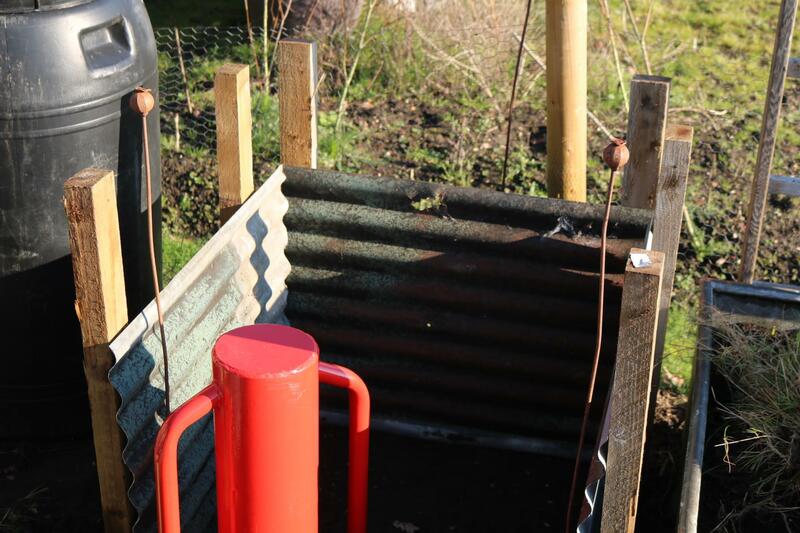 There’s still a little bit of work to do to the bin before it’s officially finished… I want to add two stakes at the front so I can slot wooden planks which will act as a barrier and stop the manure from falling out. There’s also that fertiliser shelf to put on the top but apart from that I’m just so pleased the main structure is finished! I’m a little bit pleased with myself too and I’m so happy with how it looks. The messy corner is nearly tidy! 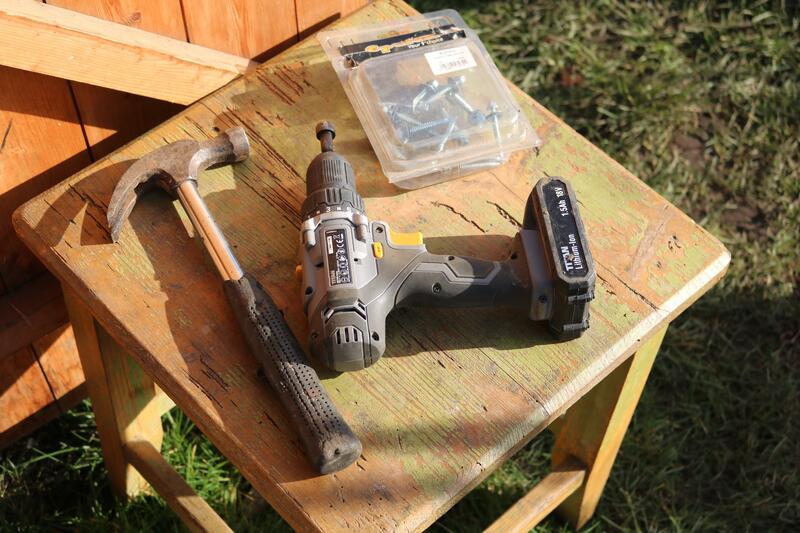 A simple and easy project that can be completed in a day (when you have the right tools!) and looks the part too. 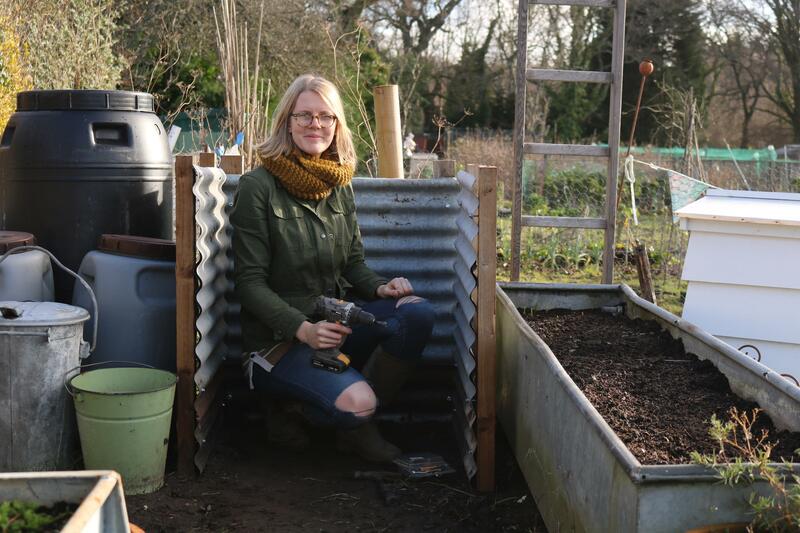 It could also be used as a compost bin or somewhere to store leaf mould and if I had the space I would definately have a row of them for all these uses. 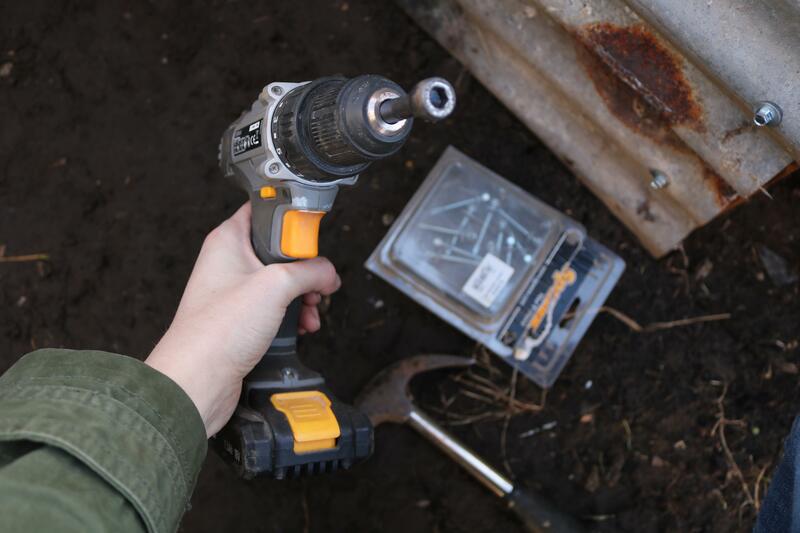 I used 18 self drilling screws with washers as I had these left over from the roof, but you could simply use nails with large heads. Thanks so much Barbara, feels good to finally complete it! Great job Katie. 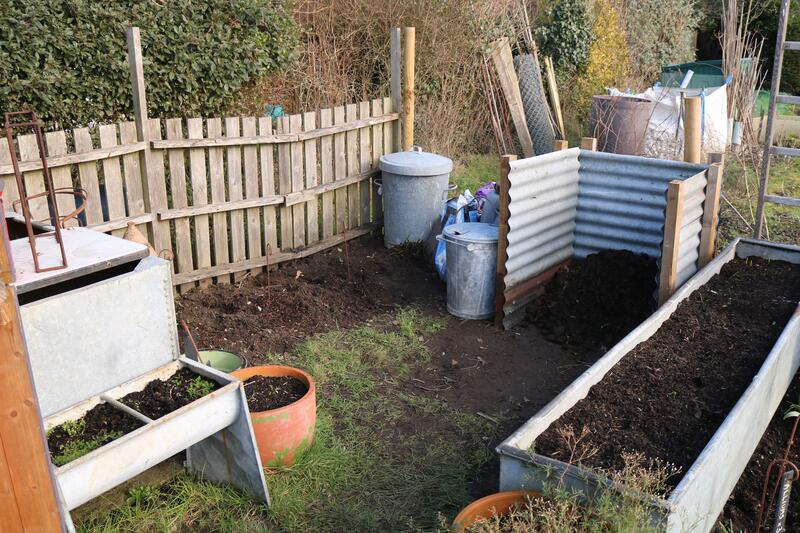 I wish I could have an open compost area like that but I need to have bins for various reasons. Love your little plot. 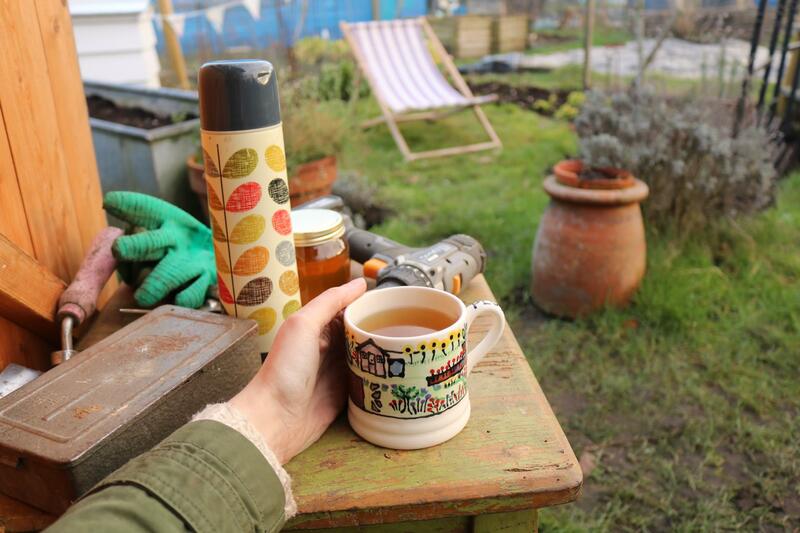 Hi Louise and thank you, I wonder why you have to have bins on an allotment site? Katie……..you are a marvel……I so enjoy reading these posts……thank you!